The last time I came to Egypt, I saw the Nile only as a line of green from the aircraft and I wanted so much to explore the romance of it. But, I was exploring the romance of the desert and it’s oases, the library at Alexandria and the war stories of El Alamein, so the Nile stayed a dream for another time. Now I am sitting on a ship on the Nile. The desert spreads out on one side, with some ancient ruins and a tiny temple on top of a dune. The city of Aswan is on the other. Yesterday we had a most amazing drive through the desert, miles and miles of it to visit the temples at Abu Simbel. That they moved all that way to build a temple in some obscure part of the Desert, just boggles the imagination. Obviously the Nile was the connector and they used it as a roadway as well as everything else, even so the size and precision of the construction and the amazing detail of frescoe and carving are astounding, as everywhere in Egypt. That it was Ramses proclaiming sovereignty over Nubia is all understandable, what amazes is the feat of such incredible construction in the midst of no where or what, perhaps today, appears random and the importance has been lost, literaly in the sands of time. What is much more amazing is that it was lifted from its original spot and moved higher to prevent it being submerged by the waters of the lake once the dam was built. So starts my sojourn with classical Egypt. I have spent the most interesting afternoon boating across the lake to visit the island of Philea and the amazing temple of Isis, there. A temple that was partially submerged by the dam and finally moved to the island, another amazing feat – it seems to have been perfected here, and truly looking at the art on those walls, it would have been sacrilegious to have drowned it. It is a temple that combines the Pharaonic, Greco and Roman styles, and you can see where the early Christians have defaced many of the amazing carvings because of their paganism. There is a particular story of Hathor’s nurturing of Horus, from childhood to teenage and the artists depiction is of her still nursing him to show that, so easily misunderstood by a tight mind, and the complete defacement of her face proves it. We are now seated on the deck of the ship watching the lights reflecting in the swift flow of the Nile. A wonderful day. The boat sailed just before sunrise this morning, along the river, green palmed banks, backed by the golden desert. We stopped at the temple of Kom Ombo, a double temple to the gods Horus and Sobek. Being on the banks of the Nile and infested with crocodiles, the people of the area decided Horus was not enough protection and started to worship Sobek as well, thus, the small temple of horus was rebuilt into a large temple with shrines to both, and high priests that had secret passages and managed to amass huge wealth by talking through tunnels misleading the rich and able contributors into huge donations. They even had a secret passage to escape if their treachery was discovered, which led first into their storage room and then out, so they could retrieve the most precious of their treasures. There was still colour in patches, and one can imagine how intricately it was painted and just how vibrant it must have been. They used oxides, so the obvious blue, red and yellow have sort of survived in patches, because the stone has absorbed it. They must have been totally brilliant in their hey day. The bits that survive are intricate with detail, patterns and weaves on the clothes and perfectly formed appendages, it must have been an amazing work. We continue to float along this mighty river, with the life along its banks. Fields of sugar cane, people washing their clothes and bathing. Feluccas in full sail. Our next stop is Edfu, a dirty little city with the most complete temple that exists in this part of the world. A tonga ride took us to the temple. Another temple dedicated to Horus, but here we could see how they must have actually been, with the roofs and columns almost intact, the inner sanctum and the storage rooms. We have a most learned guide, he makes the panels come alive as he tells the stories depicted which makes a visit to the temple much more than just a wander around an ancient shrine. Of course the early Christians tried to destroy this too, but it was too large and with too much work, so they tried to burn it down. That did not happen to solid rock, but it defaced the colours completely, finally they did all of mankind a favour and decided to bury it, leaving it for posterity to discover, relatively well preserved and complete. 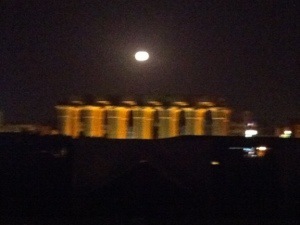 It is a brilliantly moonlit night on the steadily widening Nile. There is more habitation along the banks and much as I would have enjoyed a small felucca cruise more, this has been rather enchanting. Luxor, the place of kings. How did they discover a mountain that looked like a pyramid and decide to use it as their burial ground? And those tombs, white limestone painted brilliantly, an amazing concept, a whole valley dedicated to untold riches. When you look at the treasures recovered from the most current tomb of Tut ankh Amon, a young, lesser pharaoh, the mind tries to absorb what must have been stolen and melted down through the ages, absolute fortunes of incredible artefacts. Then the largest temple complex at Karnak, mammoth pillars, huge carvings, stories unfolding on the walls, generations of them, beautifully carved and depicted with such detail and finesse. Colonnades, avenues of sphinx, leading to the temple at Luxor. The ancient ruins house an incongruous, newer mosque, but it is so hard to impose on the grandeur of the earlier structure, that it overshadows all. It has been a surfeit of immense, man created phenomenons all flowing along with another incredible river, a body of water that greens a desert and allows a civilisation. I will have to visit the Nile again, it is yet unexplored.